BRIDGEWATER, N.J. — A waitress in New Jersey has been fired after an investigation into claims that she doctored a customer’s receipt and forged a note in an attempt to make it look like they refused to tip her because of her homosexuality. As previously reported, Dayna Morales, a server at Gallop Asian Bistro, posted a photo on Facebook last month of a receipt with a line through the tip section and a handwritten note that read, “I’m sorry, but I cannot tip because I do not agree with your lifestyle.” She claimed that a woman she served called her “Dan,” declined to tip her and left a note on the bill. “I am thoroughly offended, mad, p***ed off and hurt that this is what her kids will grow up learning and that I served in the Marines to keep ignorant people like them free,” Morales wrote in her status. The story soon went viral and donations from around the world began pouring in as many felt sympathy for the waitress. However, after seeing the story on the news, a couple from New Jersey recognized the receipt as looking familiar. They compared the bill and became convinced that it was their check as all of the data matched, and the name on the credit card could still be read under the redacted area. However, as opposed to Morales’ copy, the couple’s receipt showed that they had tipped the waitress $18, and included no such note. 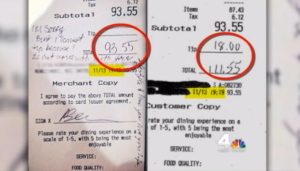 Disturbed by the situation, the couple contacted local television station WNBC to show their receipt, which was printed at the exact same time and date, and with Morales’ name at the top, but with the tip included. They also presented their Visa statement, which indicated that the tip had indeed been deducted. On Saturday, Gallop Asian Bistro announced that although its internal investigation was “inclusive” as to what really took place that night, management decided that it was best that Morales be terminated. The New York Post notes that some of the donations received by Morales are being quietly returned. Morales had told reporters that she would be donating $3,000 to the Wounded Warriors Project, but no contribution has been received to date. The Daily Caller outlines that Morales claimed in the past that she had cancer and was a lone survivor in a bombing in Afghanistan, but she was was never in combat and was discharged from the military for failing to appear for drills.